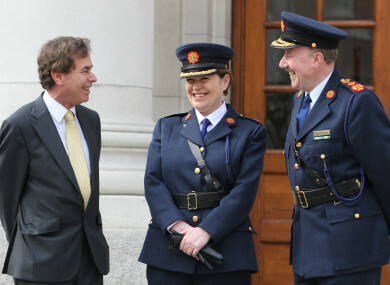 Justice Minister Alan Shatter with former Garda Commissioners Noirin O'Sullivan and Martin Callinan (March, 2011). AFTER A TUMULTUOUS few years for An Garda Síochána, it could be faced with a new chapter of change next year in the form of its next commissioner. On RTÉ News at One today, Minister for Justice Charlie Flanagan said that he expects that Ireland would have a new Garda Commissioner by the end of the summer in 2018. Flanagan added that he would be meeting the chair of the Policing Authority and the Public Appointment Service in early January to discuss the appointment of a new Commissioner at a crucial time for An Garda Síochána. The last Garda Commissioner Nóirín O’Sullivan announced her retirement from the Gardaí in September following months of calls from the opposition for her resignation. She was asked to resign because of a number of scandals that rocked the force this year, including more revelations relating to the Maurice McCabe saga; the inflated number of breath tests over a number of years; and the alleged misuse of funds at the Garda college in Templemore. O’Sullivan was appointed as Garda Commissioner in November 2014, after the previous commissioner Martin Callinan stepped down after describing Garda whistleblowers’ allegations as “disgusting”. In October this year, O’Sullivan was appointed the Director of Strategic Partnerships for Europe in the International Association of Chiefs of Police. Dónall Ó Cualáin has been appointed Acting Garda Commissioner until a replacement for O’Sullivan has been found. Last month, Ó Cualáin wrote to the Minister for Justice about concerns relating to the Gardaí’s cooperation with the Disclosures Tribunal. Earlier today, it was announced that the Department of Justice would be internally split into two parts: one under the title of ‘Home Affairs’ and another under ‘Justice’. The justice division would include crime, security and international policy, while home affairs would cover policing, prisons, courts and equality. It comes after a series of controversies in the Department of Justice which have led to the resignations of ministers and secretary generals, most recently the resignation of Frances Fitzgerald following controversy around the legal strategy used against Garda whistleblower Maurice McCabe during the O’Higgins Commission. Following the revelations over the department’s failure to find and send on relevant documents and emails that should have gone to the Charleton Tribunal, there had been speculation that a major overhaul was on the cards. Today’s announcement that the Department would be split are based on recommendations made in the Toland report, which was published in 2014. Email “We should have a new Garda Commissioner by summer 2018”. Feedback on “We should have a new Garda Commissioner by summer 2018”.